Floyd Mayweather Jr. (44-0, 26 KO’s) thinks WBA/WBC junior middleweight champion Saul “Canelo” Alvarez (42-0-1, 30 KO’s) will be looking to strip away a significant portion of his fan base by beating him on September 14th in what will be the first time the 22-year-old Canelo has headlined a pay per view event on his own. Mayweather doesn’t intend on letting the red-haired Mexican fighter do that to him, and he’s focused on using his vast experience to come up with a plan to beat him when they face each other at the MGM Grand in Las Vegas, Nevada. Mayweather is probably right about Canelo gaining a lot of his fans if he beats him in this fight. Mayweather isn’t going to lose many fans himself, but Canelo will definitely gain a large amount of fans from this fight from Mayweather’s side and from fans that don’t have a real preference about who wins. The only way Canelo comes out of this fight without gaining a lot of fans is if Mayweather dominates him like he did Victor Ortiz two years ago. In that fight, Mayweather was fighting a younger guy in Ortiz, around the same age and the weight as Canelo, but it quickly turned a route in the center of the ring with Mayweather dominating Ortiz and hitting him at will. Canelo is slower than Ortiz in terms of hand speed, and doesn’t have his stamina or his jab. Canelo has more power than Ortiz, but not much more. 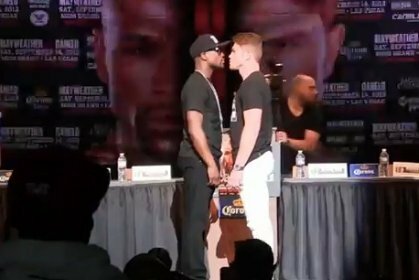 The only real differences I can see between Ortiz and Canelo is that Canelo has a tighter defense, and he can take more punishment. The power difference between them isn’t enough to bother Mayweather, and Canelo is a lot slower than Ortiz. If Mayweather can dominate Canelo like he did Ortiz, then I don’t see Canelo gaining many fans in losing to Mayweather. We might actually see that happen because Canelo didn’t impress against Shane Mosley and Austin Trout. He was tired in both of those fights by the midpoint, and without the open scoring, you can make an argument that Canelo might have lost to Trout because he would have been forced to fight hard while tired. The open scoring let Canelo take badly needed rest breaks. There won’t be any open scoring on September 14th for Canelo-Mayweather. Previous boxing news: A Coming Golden Age?